How is life in South Korea for an Irish expat? Eat Mammy Brownes brown bread and possibly learn to actually make it. Eat anything else that Mammy Browne made, apple tart, buns, scones, anything and everything. For snacks eat Taytos, Cadburys, Roses and anything else that may be lying around the house. For an additional snack, eat some proper cheese. Drink Lucozade like it’s going out of fashion. Learn at least one new tune from Kathryn and play music until Mum gets angry with us. Go to Mass and have that conversation about the homily and the priest and the crowd with anyone who wasn’t there. Say the rosary with Grandad (random, I know, but it’s the small things in life). Put on my wellies, go outside, walk around and pretend to herd the cattle or sheep. Prepare suitable phrases for Dad that I did a good job on the herding. Be a gap stopper for a few hours. Play a session in a small pub. Meet all my friends and neighbours. Meet my aunts, uncles and cousins and catch up on anything I’ve missed. Spend as much time as possible with Mum, Dad and Kathryn. Do the shopping in Dunnes Stores. Go to the Mc Donalds drive through in Roscrea with Kathryn ( it’s a long story). Take a million pictures and threaten to make a powerpoint presentation as my present to my friends in Korea. 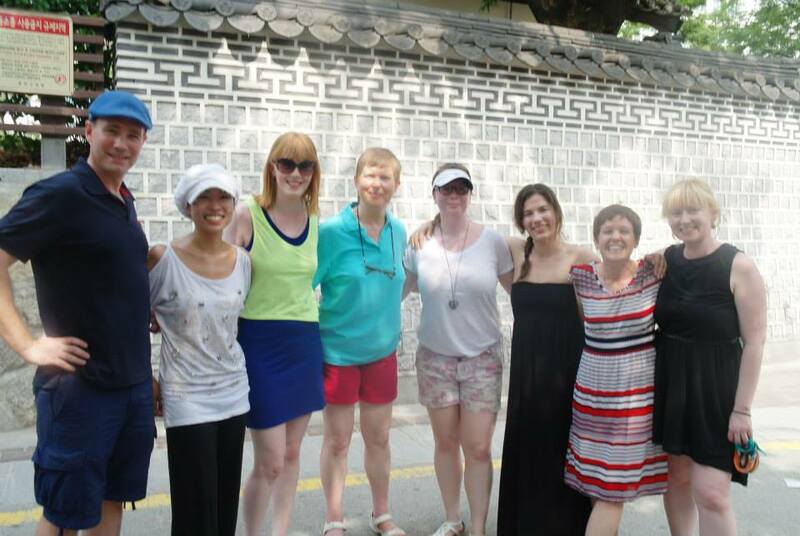 Day 1……..
Tell stories that start with “When I was in Korea…….” with Alexa and Ali. Do a few tourist things with Ali, Alexa and Kathryn. Find my old hurl and bring it back to Korea. Buy loads of nice things to bring back to Korea. Drive “my car” around the yard. Count in the New Year with my family. Buy storybooks on Irish folk tales so I can read them to my students. My sister is stealing my country and other random thoughts. For four years, I’ve been the only Browne in Korea. It was a great novelty back home, “Shauna, the one in Korea”. I had a monopoly on this country. It distinguished me from my older sister ( “the one in Spain”) and my younger sister ( “the one in college”). Such distinctions are extremely important. Now, in exactly 2 weeks, my sister and her partner are moving here. She took my friend’s job and coincidentally her apartment will be literally a 30 second walk from my one. So many thoughts come to my mind, most of them purely selfish of course and I wonder if all expats feel like this when a family member comes to live in their country. I literally spent all four years telling her that she should move here but it wasn’t until she finally came on a summer holiday that she saw that we were in no danger from the dreaded North, the food was edible and although the people don’t speak English and there are oh so many of them, we all still manage to hang out and have a great time. Also, on the plus side we have phones that she’s never even heard of, internet that’s so fast you wonder why someone would live anywhere else and a transport system that is extraordinarily efficient. So Korea is a natural choice. But, one little part of me is thinking “really, you couldn’t just pick a different country?” It’s going to confuse everything. “Shauna, the one in Korea or is that Majella that’s in Korea. But aren’t they both in Korea now”? She’s already friended some of my friends on Facebook. I’m sure there’s some etiquette law against that sort of thing. Really? You stole my country, now you’re reigning in on my friends!? It’s almost like this is one of those ready made lives. A great job in a great school she knows she won’t have any problems with, a great apartment, a sister who already knows the area, already has the contacts and has already made friends that you can be introduced to. When I think back to my first time coming here, like all my friends, we did it on our own so in some ways, I find this to be the height of cheating although if I were her, I’d probably be moving to Korea now too. I know a few people with siblings here in Korea and I wonder if all of them think the same thing or is it just me. Then there’s her partner. He’s Spanish and although they’ve been going out for years, I’ve only ever seen him about 3 times. The only Spanish I know is Hola and a few other random phrases I learned from Dora the explorer so Skyping is like speaking to the U.N. I say something. My sister translates it and then translates his response. Recently though, he’s learned English so this will be the chance to actually get to know him. When people ask me if I’m excited for her to come, I’m fairly slow to respond. When we were young, fighting was something we were champions at. Obviously we’ve grown up now but we still manage to have blazing rows over What’s App. Sending each other messages in CAPITAL LETTERS to make a point. And a few times, we’ve had to cut off Skype because we will have gotten into a fight and hanging up is the only option since we can’t just hit each other. So, with her living next door, I wonder how our relationship will develop. Since I moved to Korea, we’ve stayed close enough but I wonder how it’s all going to go. Will she look to me for advice or will it be the other way around since I’ve been here longer. Will she be my left arm or will she branch out and do her own thing and get her own hobbies etc? So many questions that only time will answer. Of course, after it’s all said and done, I am delighted that she’s coming here. She is my sister after all. Stay tuned to this blog for more on what happened after she arrives. 9 reasons I love going to the cinema in Korea. 1. English Movies; That’s right folks, we have English movies here. If you can see it in Ireland, you can see it here. 2. Great choice of cinemas; Lotte, CGV and Megabox are three of the big cinema names here so if you can’t find your movie in one, you can just go to the other. And they all generally have their cinemas in the same area so it’s fantastically convenient. 3. The price; Back in the day when I used to live in Ireland, a trip to the cinema would cost me about 7 euros for a ticket. That’s about 10,000won. For a regular ticket here, it costs 9,000won. Of course it’s a little more pricey for the IMAX, 12,000won and if you’re going to splash out of 3D it’s about 18,000won. Either way, it’s much cheaper that what you pay back home. 4. Reserving tickets; If you want to watch a movie at a peak time but really want to get good seats in advance you have 2 options. 1. Go the the website of the cinema and try booking it there. Or 2. Go to cineinkorea.com and book it with them. I did this once and honestly it was so easy. It was all in English and they sent me a message with a picture of the seats to make sure they were ok. Amazing. 5. The ticket machines; If you want to buy your tickets at the cinema, you can just rock up and get them from the ticket machines. The machines are in Korean so by just looking foreign and helpless you are guaranteed that a helper will come along and do it all for you. But if you get your tickets from the counter, they had you vouchers with your tickets. Making it look like you’re getting great value for your money. 6. The popcorn; Possibly the best part of going to the cinema here is the popcorn. So many delicious flavours to choose from, onion, cheese, garlic, caramel, regular, the random flavours at the posh CGV’s. And if you can’t decided, you can get a half and half so you can enjoy 2 flavours. Amazing. 7. The movie theater; Always super clean and comfortable. My favourite has got to be the IMAX. I just saw a movie there today and I literally thought I was part of the hunger games tributes, “I VOLUNTEER AS TRIBUTE! I VOLUNTEER AS TRIBUTE! PICK ME! PICK ME!You get the idea. 8. The upper hand; Usually the foreigners are the last people to know what’s going on. This changes the second you go to an English movie here. They do have Korean subtitles but jokes just don’t translate well. So, the foreigners are the only ones laughing causing the Koreans to laugh at us laughing and the whole thing is pretty great. 9. The staff; At the end of the movie, when you walk out, there are staff there bowing at you and telling you to come again. Sometimes these staff even give you vouchers. It’s like the perfect ending to the cinema experience. It’s the small things in life. 1. Hello– 안녕하세요. Anyeong ha sayo. 5. Where is the ___________? ________ 이 어디에 있어요? ___ o d eh is oh yo? For example, “Where is the bathroom?’ The word for bathroom is 화장실( hwa jang shil) so the sentence becomes 화장실이 어디에 있어요? 6. How to I get to _______? _________ 어땋게 가요? o ddeok kay gay yo? For example, How do I get to Seoul is 서울 어떻게 가요? 7. I’m sorry– 미안해요. me ann ham ni da. There are a few ways to say I’m sorry. You can use this for any situation where you should apologize for something. 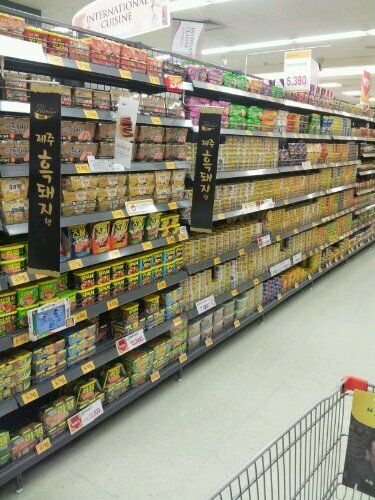 8.Discount Please, 갂아 주세요. Gakk ah chew say yo. This can only be used when the price isn’t set. For example at a market or somewhere. 9. Simmer down/calm down; 침착해요. Chim chak hay yo. A great one if you’re out and about and someone is bothering you or something like that. 10. How much is this? 이거 얼마예요? e go ul mah eh yo? (이거 being “this”). 12. Really? 진짜? jiin ja? I love this word! Even these days when I can’t follow my student or whatever I just reply “진짜”? It’s not very much fun just reading it here is it? No. That’s why Janet and I put together a little video of how to pronounce it and we loved it so much the memory card ran out of space. So this video is part one and we’ll post part 2 next week! Since we’re not Korean we probably made mistakes in spellings so apologies. If you want to see us do any more videos on Korean or life in general in Korea or whatever, leave us a comment or tweet us, @iamshaunabrowne or @janetnewenham. Someone I know very well is getting ready to come to Korea for a year. This means that there are many questions so I thought I’d do a blog on the most useful. DISCLAIMER; This information as to the best of my knowledge. Rules and regulations change all the time. Be sure to speak with your recruiter to confirm any queried you might have. This blog is written with Irish people in mind. Q1. What documents do I need? Signed copy of your C.V.
Apostille – http://www.dfa.ie/home/index.aspx?id=268 I’ve just gotten my documents reapostilled in the run up to my renewal (long story about what happened the first time) and they came back within the week so it’s a pretty speedy process. Q2. When should I start preparing my documents for Korea? This depends on the country you’re coming from and every situation is different. For Irish people, I would say 4 to 5 months. The Garda check must be recent (within the last 6 months) so keep that in mind. After that the transcripts and apostille vary from university to university so getting them organised 5 months in advance is no harm. The last thing you want is to receive a job offer and not have your documents ready. Be prepared! *The contract is the last document you need to collect and you will get it upon receiving a job offer. Q3. How do I contact a recruiter? So many choices here. If you know someone who’s already here, ask them. If they’ve had a good experience with their recruiter, chances are you’ll have a good experience also. If you don’t know anyone, then do some research. 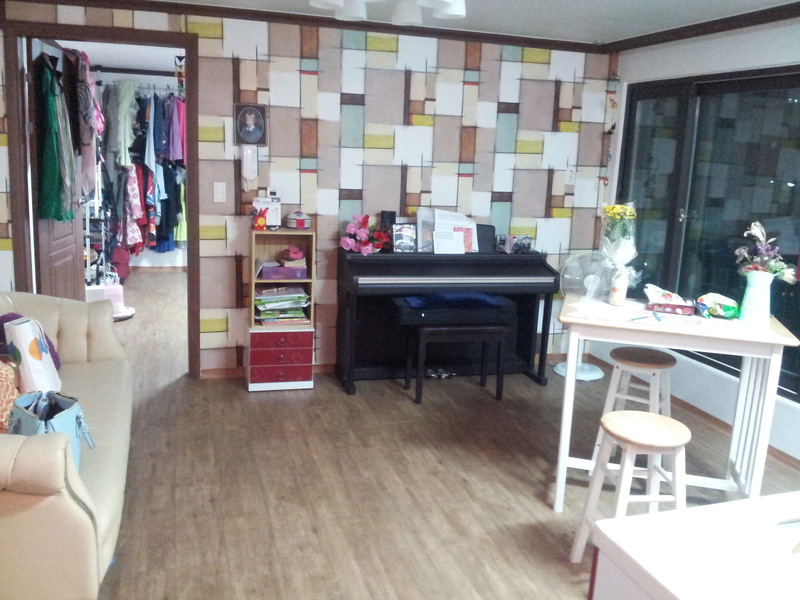 Read other blogs from expats teaching in Korea and see what they say. It might be a good idea to know what you’re looking for in a job. Do you want to be in Seoul, a suburb, the south, the east, where? Do you want public school (EPIK, GEPIK, SMOE) or an academy? Do you want to work mornings or start in the afternoons and finish later? Think about what you really want so you can make it easier for the recruiter to find you a suitable position. Q4. After I’m offered a job, how do I get a visa? This is something your recruiter will take you through. When you have all your documents ready, DHL or FED EX them to your recruiter ( so you can track them). You recruiter checks them and sends them to your employer who brings them to immigration. Your employer will be given a visa issuance number and will send it to you via email. You then make an appointment at your local Korean embassy. Bring your passport, do your interview and you will be given your visa in a number of days. Q5. Do I need to get vaccines to go to South Korea? If you want to you can. If you don’t want to, you don’t have to. It’s a completely personal choice. Q6 What are the holidays like? Q7. What is an alien registration card, when do I get it, how do I get it and why do I need it. If you intend to stay in Korea for longer than 90 days you must apply for an ARC. The card has a number on it that you need to open a bank account, get a phone in your name, get cable, visit the hospital or anything like that. Once you arrive in Korea, you school will bring you for your health check and when they receive the results of that, they will apply for the ARC. When you get it depends on the immigration office and how quick you can get the health check done. I waited just 2 weeks for mine but I heard my friend say that she waited 5 weeks for hers because of some backlog so just ask at immigration and they’ll know. Q8. Is it difficult to get a phone and bank account? For a phone; Once you have a bank account and an ARC, head to a phone store, choose your plan and phone and they will set you up. It’s pretty easy and most of the time someone speaks enough English to get the message across or you bring someone Korean with you. It’s up to you but don’t be afraid to try it by yourself. Q9. What should I bring? Remember you are coming for a year and you only have about 23kgs to pack it in to. So pack wisely. Winter here is super cold and summer is hot. 1 or 2 towels to get you through until you can buy more. A super big bath towel. You’re favourite shampoo/hair dye/perfume/ makeup or whatever. At least enough to get you through until you figure out how to get more. Pictures of your family and friends or some things that you can bring to remind you of home. Q10. How do I get involved in expat life? The Irish have a strong community here. The Irish Association encourages Irish culture in Korea. Their website is www.iak.co.kr . The Seoul Gaels are a sporting organisation http://seoulgaels.weebly.com/ There are also plenty of meetups happening for every interest. Check out meetup.com and search for your interest in Korea. Check out seoul.angloinfo.com for expat living in Korea. Feel free to leave questions and comments! Every family should visit you abroad. When I share stories about my life here with other people, most of the time they don’t understand. It’s not their fault. They’ve usually never been here and don’t understand the culture or the way of life so the significance sometimes gets lost. If someone back home were to look at my Facebook page for example, they might be lead to the conclusion that I spend my time travelling, playing music, sharing funny stories about my students and socializing. I’ve spent every Skype call for the past four years reassuring my family that I am indeed doing alright. I have a job, money, accommodation, friends, a life. They’ve spent four years asking questions, “what do you do out there?, when are you coming home?, what’s the food like?, hows the weather?, what do you do at the weekend?, do you ever get a holiday? is it not dangerous so close to the North?”. The questions go on and on and sometimes I do well answering them but most of the time I don’t. It’s something you must experience. 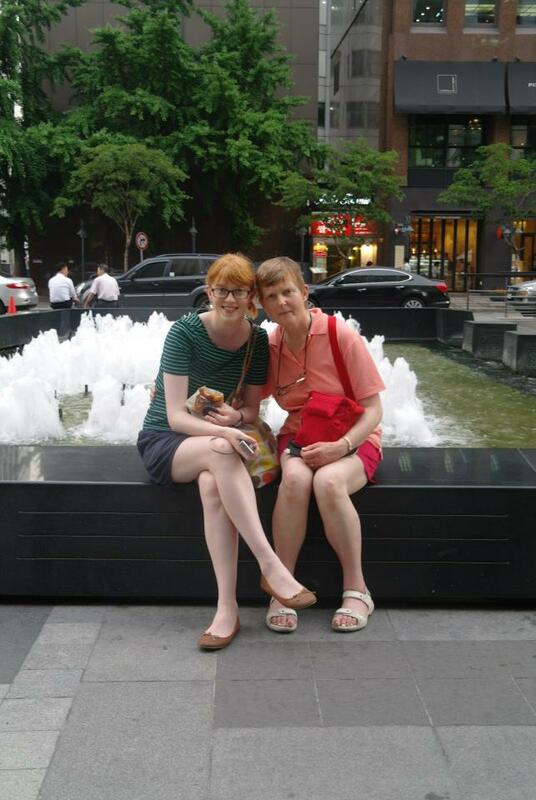 Before I left for Korea in 2009, the final words my mother said to me in Dublin Airport were “Shauna, if I think you’re going to stay a long time, I’ll come to visit”. I’m not exactly sure if she had an exact timeframe in mind when she said that, but I guess four years is it. A few weeks ago, my sister told me of their big plan to come out here. My mum and older sister are now halfway through a two-week visit and I can honestly say, it’s the best thing they could have done. The things that I take for granted are such novelties for them. The first day they walked into my apartment, my sister asked where my keys were as she watched in fascination as I entered my door code. The idea that I can actually read and converse in Korean is a novelty and they are thinking of ways to get my gas range back to Ireland. My mum calls my phone addiction “networking” and my sister hides her iPhone minus 1 for fear of ridicule from Koreans. (Honestly, I don’t know what version it even is but I haven’t seen it in Korea EVER). The giant screens, the technology in the subway stations, buses and everywhere else is so fascinating. High rise apartment buildings and shops that are on a floor other than the ground floor are possibly the most greatest fun. Of all the things they’ve done and seen, I think what surprised them the most was how strong Irish culture is here. We organised a session in Seoul for our visitors (my family and my friends family) and Mum couldn’t stop talking about how great the Korean musicians were. I’ve spent over three years telling her but it was only after she heard us playing that she understood. We’re also heading to a ceili on Saturday night and I think that it’ll be this experience that Mum will take home with her. When Mum asks me how I know people, I mention the Seoul Geals and she’s even more astonished that there’s sport as well as music/dancing. Now she understands that although we look in pictures like we’re enjoying ourselves at Irish events, we also put in the hard work to make them happen. She wouldn’t have understood had she not come here and seen it for herself. Coming to Korea and indeed to Paju has gone a long way to showing them that living close to North Korea doesn’t mean anything in day-to-day living. Every time North Korea pop up in the news, people at home gain images of military swarming the area and checkpoints and all kinds of tension and so on. They now see the reality that life here is safe and actually a little boring, not at all living up to the images they had conjured up. This week, I have their schedule jam-packed with lunches and dinners with my friends to make sure they meet every one of significance. Putting faces to the names that I talk about and seeing a bit of the personality behind those names is great. Whenever I’ve had a problem in Korea, although Mum gives great advice, it’s these friends that have been there to help me out of it. For my real family to see my Korean family brings with it a certain knowledge and comfort that I’m far from alone out here. Most of all this trip reinforces the idea that this isn’t just an extended holiday I’m on. I have a real job, real responsibilities and a real life. So many times, when North Korea pops up in the news or something bad happens, we all get the emails to just “come home”. Now, my family see that dropping everything and heading back to Ireland isn’t all that easy. Living abroad, it’s always great to return to the comforts of home for a visit and share the stories of your travels. Having your family walk a mile in your shoes, however, is the best way to help them understand how you live your new life, how you made this life what it is and what keeps you where you are. I know my mother is here because…….. The dishes are all washed, always. It’s like magic. I, as usual, throw them into the sink for later. But later, they have not only been washed but dried and put away. The bottle of wine is still in the press. It’s been there for a week. I fear it might be going off……………. My social life has been narrowed down to dinners with friends. I’m in bed earlier than I’ve ever been. What’s going on? 10.30pm is too early to go asleep! I’m discovering how comfortable the floor really is to sleep on. The clothes get washed every few days. Usually this only happens when I realise the basket is getting full or when I run out of something and realise it’s time to do the washing. There is so much food in my apartment, I’m running out of space for it. 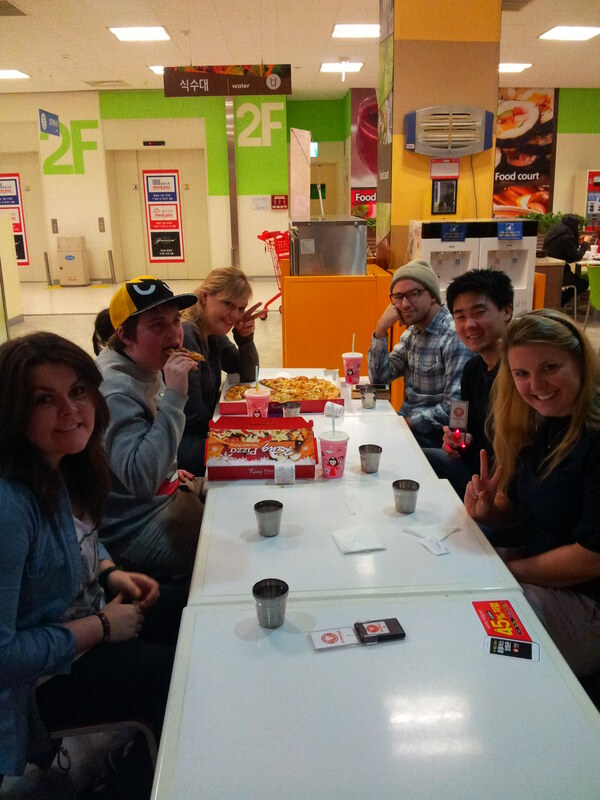 Honestly, you’d swear we were feeding the entire population of Paju. It will never be this way again. This is only a fraction of the food that you can find in my apartment. Honestly. I’m only eating relatively healthy food in an effort to make it seem like I’m qualified at being a grown up. There is a box of Dairy Milk still not eaten that screams at me every time I open the press. I’ve been to tourist sites that I haven’t been to since the first year I arrived in Korea. 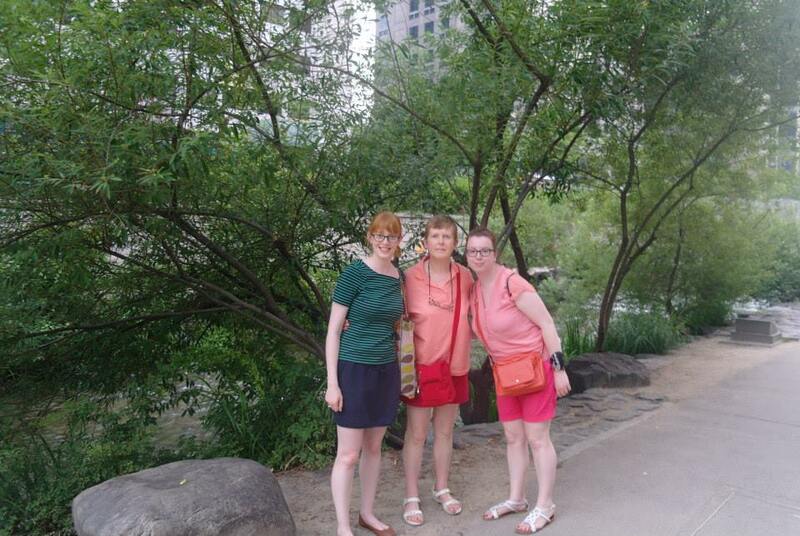 Here we are in Seoul at the Cheongaecheon stream. My Korean seems to be brilliant. Beside people who don’t speak one word, I seem fluent. This, will also never happen again. The only thing I’m fluent in is Konglish. I have money in my wallet for “petrol”. I never get petrol money from anyone over here………..
10 things to see in Havana. Thank to all your voting, Whatawaygook made the final! Whatawaygook needs you! Help get me to the Blog Awards Ireland final!